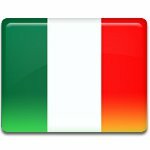 Tricolor Day (Festa del Tricolore), also known as National Flag Day (Giornata Nazionale della Bandiera), is an Italian observance held on January 7 every year. Although it is not a public holiday, special events dedicated to the national flag of Italy are held throughout the country. Tricolor Day was established in December 1996 and celebrated for the first time on January 7, 1997. As we’ve already said, it is not a public holiday, but there is an official celebration held in the city of Reggio Emilia, where the green, white and red tricolor was adopted as the flag of the Cispadane Republic, a short-lived republic established by Napoleon Bonaparte. The flag of the Cispadane Republic was designed to remind of the French Tricolor consisting of three vertical stripes. Red and white were borrowed from the flag of Milan, while green was taken from the uniform of the civil guard. After the abdication of Napoleon, the green, white and red tricolor was forgotten for some time. It experienced a rebirth during the period known as the Risorgimento, or Italian unification. People who fought for the freedom and independence used the tricolor as the symbol of their unity. In 1848, the tricolor was officially adopted by the Kingdom of Sardinia. In 1861, the flag of the Kingdom of Sardinia was declared the flag of the newly formed Kingdom of Italy.